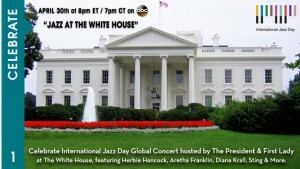 International Jazz Day, April 30: From the White House to Your House! 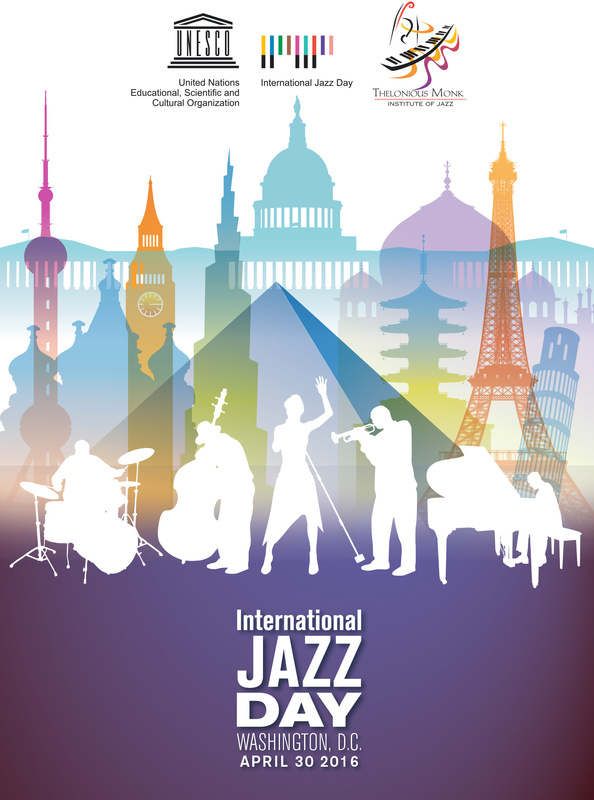 The United Nations Educational, Scientific and Cultural Organization (UNESCO) again sponsors International Jazz Day on April 30, a series of celebrations around the world that pay tribute to America’s original art form — jazz. This year the All-Star Global Concert takes place in Washington, DC at the White House, hosted by President Barack and First Lady Michelle Obama, featuring a star-studded line-up including Herbie Hancock, Diana Krall, Chick Corea, Wayne Shorter, Pat Metheny, Al Jarreau, Aretha Franklin, Sting and more. This fifth annual event also includes registered programs throughout the U.S. and beyond, including the Jazz Central Fundraiser and Festival in Minneapolis, which will be held from 1- 6 pm in the A-Mill Lofts along the Mississippi River, featuring special guest, trumpeter Brian Lynch. Presented each year on April 30th in partnership with the Thelonious Monk Institute of Jazz, International Jazz Day highlights the power of jazz as a force for freedom and creativity, promotes intercultural dialogue through respect and understanding, and unites people from all corners of the globe. The day is recognized on the official calendars of both UNESCO and the United Nations. Major sponsorship this year is provided by Toyota. “Jazz was born in the US and traveled the world as a music of tolerance, freedom and human dignity. This is why UNESCO created International Jazz Day and we are extremely pleased that in 2016 Washington, DC has been designated the host city for this global celebration, with a unique All Star Concert at the White House, hosted by the President of the United States Barack Obama and First Lady Michelle Obama. This event reminds us Jazz is more than music – it is a universal message of peace with rhythm and meaning,” declared the Director General of UNESCO, Irina Bokova. 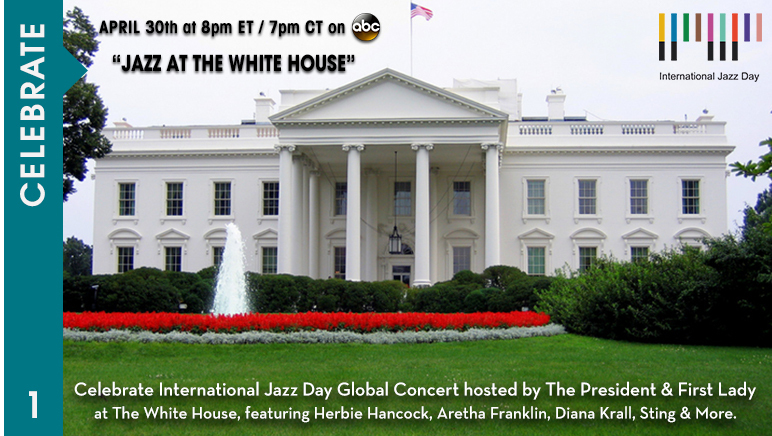 The All-Star Global Concert will be televised on ABC as a one-hour primetime special, “Jazz At The White House,” on Saturday evening, April 30th and streamed on the United Nations, UNESCO, U.S. State Department and White House websites. In addition to the “headliner” artists noted above, the White House concert will also feature performance by Joey Alexander, Terence Blanchard, Kris Bowers, Dee Dee Bridgewater, Till Brönner, Terri Lyne Carrington, Jamie Cullum, Kurt Elling, Robert Glasper, Buddy Guy, Dave Holland, Zakir Hussein, Lionel Loueke, Hugh Masekela, Christian McBride, John McLaughlin, Marcus Miller, James Morrison, Danilo Perez, Rebirth Brass Band, Dianne Reeves, Lee Ritenour, David Sanchez, Trombone Shorty, Esperanza Spalding, Chucho Valdes, Bobby Watson, Ben Williams and more; John Beasley will serve as Musical Director. 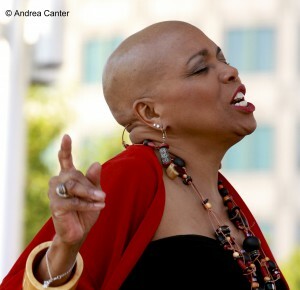 Many acclaimed musicians and educators will participate in a daylong series of free jazz performances, master classes, improvisational workshops, roundtable discussions, education programs, jam sessions, and community outreach initiatives at schools, embassies, arts centers, hospitals, museums, social service agencies, jazz clubs, senior centers, metro stations, recreation centers and parks across Washington, D.C. on April 30th. These programs will be among the thousands of International Jazz Day live performances, educational activities, and community service programs taking place in all 50 U.S. states and in more than 190 countries on all seven continents. 1:00 pm, The Haining-Graf Quintet with guest vocalists Debbie Duncan, Andrew Walesch and Sarah M. Greer. Saxophone titan Doug Haining (TC 7, Explosion Big Band, Corner Jazz) joins forces with master trombonist Dave Graf (JazzMN, TC 7, Salsa del Soul) and an enviable cast of instrumental and vocal sharpshooters. 2:15 pm, Javier Santiago Trio. A veteran of the Twin Cities jazz scene since his early teens, pianist Javi graduated from the Brubeck Institute and New School for Jazz and Contemporary Music before returning to his home town where he is one of the busiest keyboardist around. New England Conservatory alum Dan Carpel handles the bass, while another young veteran and Manhattan School of Music grad, Miguel Hurtado, mans the drum set. 3:30 pm, Vinson Valega Group. After working in New York, Vinson relocated to the Twin Cities where he works as a drummer, and music and video producer, and head of Consilience Productions, a nonprofit company combining music and community action to build social awareness. 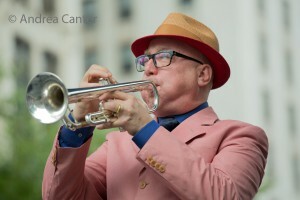 His band includes saxophonists Anton Denner and Chris Bacas. 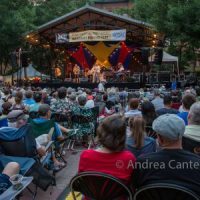 4:45 pm, Twin Cities Latin Jazz Orchestra with Brian Lynch. The Twin Cities Latin Jazz Orchestra launched about two years ago under the leadership of trumpeter Geoff Senn and drummer Mac Santiago, and features a cast of top metro musicians. 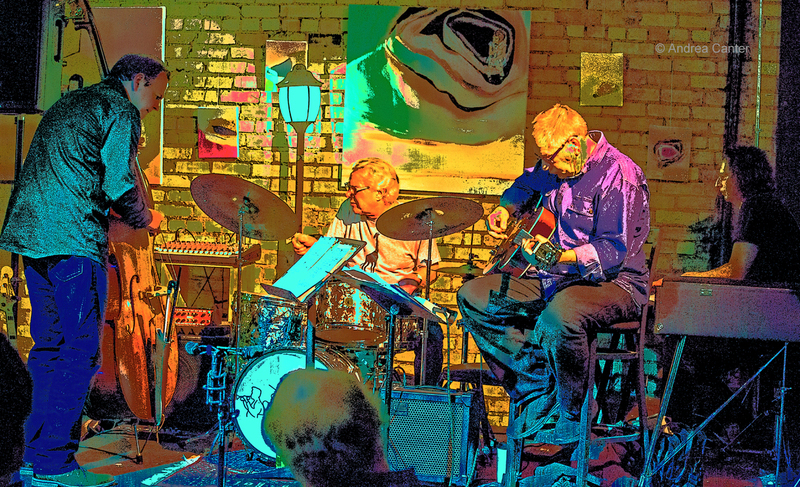 In addition to performing on the fourth Tuesday of each month at Jazz Central, the band has appeared at the Twin Cities Jazz Festival, Icehouse and more. 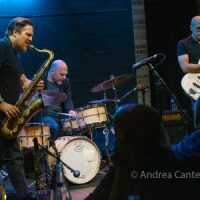 Special guest Brian Lynch cut his teeth with Art Blakey and the Jazz Messengers and the Horace Silver Quintet, and since he has worked with Benny Golson, Toshiko Akiyoshi, Charles McPherson, Prince, and–for many years–with the late Phil Woods. 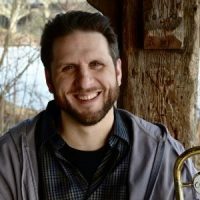 A Grammy winner and recipient of grants from NEA, Chamber Music America and Meet the Composer, Brian is also known for his Latin jazz chops and collaboration with Paquito D’Rivera. And yet another special guest will perform with the TCLJO, guitarist Andres Prado. Andres, who lived in the Twin Cities for a few years, is in town from his home in Lima, Peru, performing with old pals and presenting master classes at McNally Smith. Tickets ($25-50) for the festival are available at http://www.brownpapertickets.com/event/2533433; proceeds will support Jazz Central Studios, a nonprofit venue dedicated to performance and instruction, located in Southeast Minneapolis. 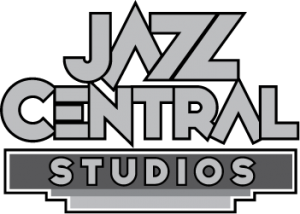 Jazz Central presents live jazz at least five nights per week — see more at their website, http://jazzcentralstudios.org The A-Mill Artists Lofts are located at 315 SE Main Street, Minneapolis. Black Dog – The Growlers 7 pm, How Birds Work, 8:30 pm. The Growlers is a new double guitar trio headed by guitarist Joel Shapira, with Dave Martin on guitar and Pete Hennig on drums. How Birds Work was a popular quartet at the Artists Quarter that continues to perform, with Dean Granros (guitar), Peter Schimke (piano), Ted Olsen (bass) and Kenny Horst (drums). 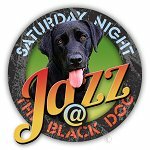 saturdaynightjazzattheblackdog.info; 308 Prince Street, St Paul. Dakota – Dennis Spears 60th Birthday Celebration, 8 pm. A birthday party on Jazz Day just seems perfect for vocalist Dennis Spears! One of the real kings of vocal jazz in our region and beyond, Dennis is perhaps best known for his Nat King Cole shows but he can go in any direction from blues to gospel to bebop and soul. dakotacooks.com; 1010 Nicollet Mall, Minneapolis. 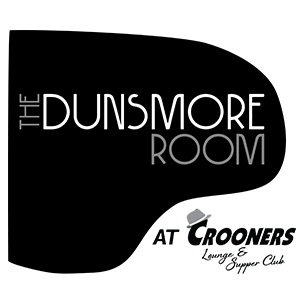 Icehouse dinner sets – Brandon Wozniak and Bryan Nichols, 6:30 pm. Enjoy the dinner hours at the Icehouse every weekend with some of the top jazz artists in town. 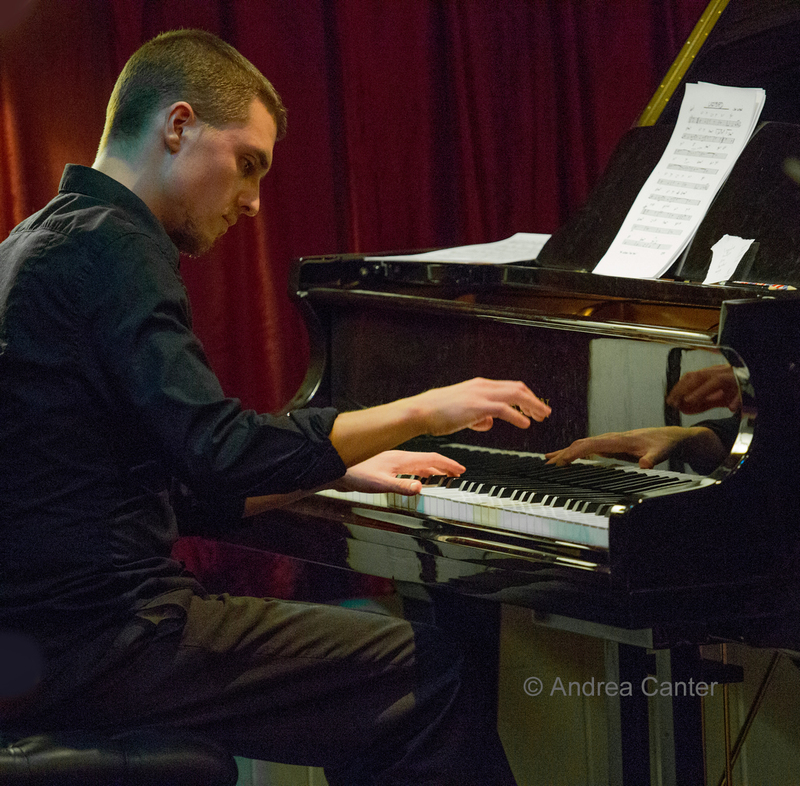 Tonight, your Jazz Day dinner features the sublime duet of saxophonist Brandon Wozniak and pianist Bryan Nichols, two of the leaders of their generation and two of the most innovative improvisers on our jazz scene today. icehousempls.com; 2528 Nicollet Av South, Minneapolis. Lobby Bar Saint Paul Hotel, JoAnn Funk and Jeff Brueske, 7 pm. Catch this magical duo before they take their annual summer break! Pianist/vocalist JoAnn Funk and bassist Jeff Brueske have been entertaining in the Lobby Bar for 8 seasons, with a repertoire running from Brubeck and Gershwin to Blossom Dearie and Diana Krall. Loring Pasta Bar – Pavel Jany’s Talking Strings, 6 pm. Guitarist Pavel Jany has introduced much of the Twin Cities to Brazilian jazz via his Ticket to Brasil. Talking Strings is a newer ensemble putting Jany in the fine company of violinist Gary Schulte and bassist Dan Weston. Saturday nights you can find them at the Loring Pasta Bar in Dinkytown. loringpastabar.com, 327 14th Ave SE, Minneapolis. 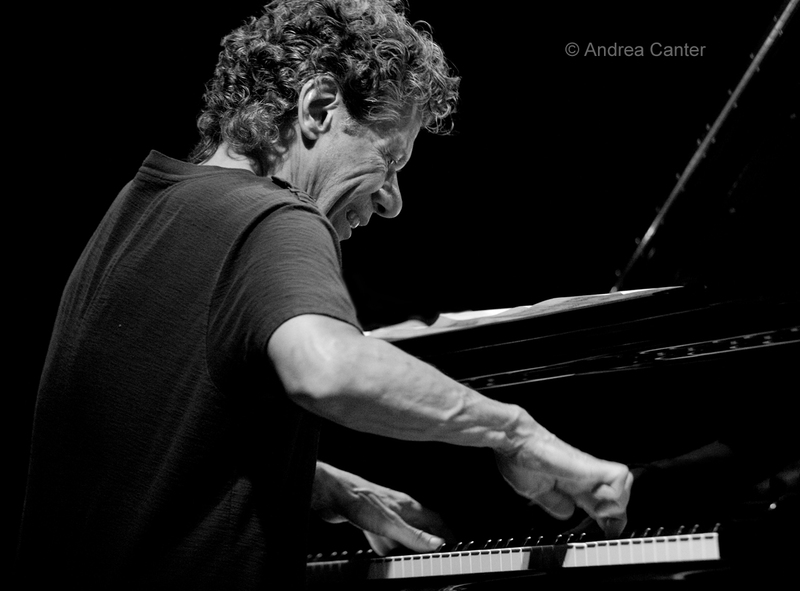 Parma 8200 – Benny Weinbeck Trio. There’s no better or jazzier way to relax than in the lounge of Parma 8200 with pianist Benny Weinbeck and his trio (Gordy Johnson and Phil Hey). The art of the piano trio at the highest level. parma8200.com; 5600 W. 83rd St, #100, Bloomington. The Cedar – Charanga Tropical CD Release. Doug Little’s Charanga Tropical celebrates their 2015 trip to Cuba where they recorded an album, released this weekend in multiple gigs. Tonight they’re at The Cedar — where there should be room for dancing. CT includes a diverse team of musicians from all corners of the globe. thecedar.org; 416 Cedar Av S, Minneapolis. Do It Yourself Jazz Day! Listen to some great music– from classics like Kind of Blue or A Love Supreme to some of the great new albums of recent months, like Nancy Harms’ Ellington at Night or Rudresh Mahanthappa’s Bird Calls or local trumpeter Adam Meckler’s new Wander. Or whatever favorites you have– it’s always time to listen to good music! Listen to jazz radio! Twin Cities jazz station KBEM (88.5 fm) has jazz and blues all-day long. Saturday night you can hear John Pizzarelli and Jessica Molasky’s Radio Deluxe; later in the evening it’s Christian McBride’s Jazz Night in America via NPR. And KFAI radio (90.3 fm) brings jazz to the air on Saturday mornings and into the afternoon, with Mostly Jazz, Rhythm and Grooves, and Jazz Diaspora. Play some jazz yourself! 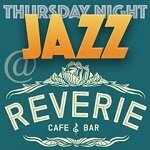 Even if all you manage is tinkering one-handed at the piano, tap out a favorite tune or, even jazzier, improvise! No one else is listening, go for it! Check out You Tube, rent a DVD, or head out to the movie theater! Two new jazz biopics opened recently, Miles Ahead (Miles Davis) and Born to Be Blue (Chet Baker); you can rent what should become a modern classic, The Girls in the Band, all about the history of women in jazz, from the Sweethearts of Rhythm to Marian McPartland.